Developed by John Mitchell of Procolour in New Zealand, the formula was acquired and further improved upon by Jacquard Products in early 2017. 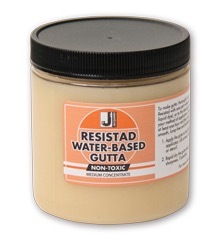 Resistad's unique chemistry offers all the advantages of both permanent and removable resists plus more, without any of the disadvantages. This is what has made it the almost universally favored resist of silk painters all over the world.